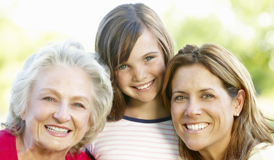 To support vitality and physical well-being. To help maintain the natural defences of the immune system. 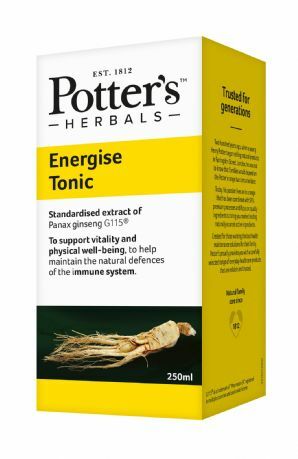 Potter’s Energise Tonic contains G115®, a standardised extract of Panax ginseng, C.A. Meyer. This long established traditional ingredient has been shown to help fight tiredness and exhaustion. 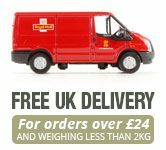 Scientifically proven to support energy metabolism, physical performance and the immune system. The Panax ginsengG115® in Potters Energise Liquid is backed by a large body of clinical trials to help support energy metabolism and the immune system, with the overall effect of helping to combat tiredness and exhaustion. Ingredients: Sweetener: Sorbitol; Sucrose, Cherry Flavour, Tutti-Frutti Flavour; Standardised Panax ginseng extract C.A. Meyer G115® 140 mg; Acidity regulator: Sodium citrate, Citric acid; Preservatives: Potassium sorbate, Sodium benzoate. Should be taken once a day in the morning with breakfast. It is recommended to take for at least 4 weeks.